I'm really surprised on the quality of this point and shoot camera. All of the pictures taken that night came out really nice it was only set in auto. I wish I can link ya'll to something on where I got the pieces that I'm wearing, but I just shopped my closet for this event. A recycled outfit that actually worked out. 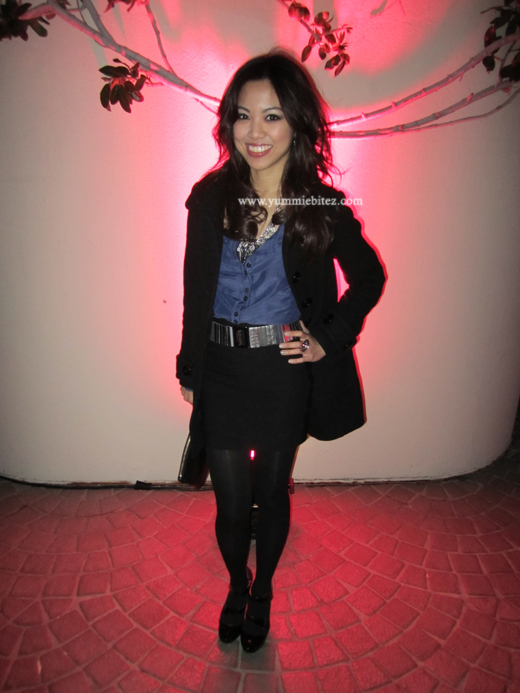 My outfit was actually inspired by Lauren Conrad while I was skimming through the pages of her style book. I didn't think I was going to be able to pull it off, but I think this is one of my favorite outfits. It was chilly last night, so I had to wear tights and a thick coat to keep myself warm. Even though there were heat lamps outside, I still get cold pretty easily. I'm not sure if you can also tell from the pictures, but my hair is a tad lighter. I originally wanted ombre highlights, but you can clearly tell that whatever I have on my hair are not ombre highlights. My stylist just lightened my hair and gave me highlights without touching my roots. Its getting some time getting used to it, but I'm still a little iffy about it. I'm contemplating whether or not I should get some blonde chunks on the ends of my hair. The only thing is by doing so, my hair will not exactly corporate appropriate. And for those who are wondering if I end up getting a digital perm, I chickened out. I just curled my hair for the night. I couldn't risk my hair becoming too dry and damaged. I will be posting up my photo blog for the Beautylish LA Spring 2011 Trend Preview on a separate post. I had too much fun. Cosmetics, cocktails, cupcakes, and company. Couldn't be any better night! the perm I had destroyed my hair and it only lasted a couple of months! I'd stay stick to the curling iron! great look! I like your blog! this recycled outfit is great. i really like that zara top.